Yoga often starts as a hobby; but then slowly grows into a part of your daily routine. It isn’t always practical to carry all your yoga must-haves with you around all of the time. I walk everywhere and often don’t have space to carry everything. 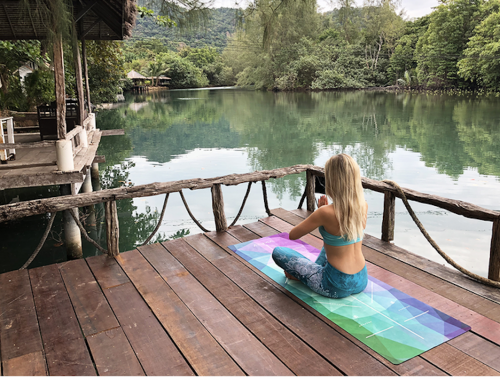 To make life easier, I discovered some travel yoga items that help marry my on the go lifestyle, with my yoga lifestyle! Here are three different travel yoga products I really love. This yoga mat is easily becoming one of my faves for travel. The mat has so many travel-friendly features and one of my favorites, is that it’s foldable. Instead of carrying a bigger bulkier mat this one is easy to tote, no matter where I’m going or what else I’m carrying. I can fold this mat up and put it in my purse even! The ALMA travel mat is really ideal for yogi’s like myself; and for sure makes it easier to practice yoga wherever, whenever! The small towel is for hot yoga, indoor cycling classes, and the gym. I love this little towel because it is so small so I can keep it in my backpack for sweatier yoga flows or Peloton runs (which I’m obsessed with lately! The towel is made with microfibre fabric that is super absorbent which is always a plus. I find keeping this towel handy is always good for an on the go class because it’s small and works well. PS moms it’s also great to keep one in your stroller for the kids when you’re out and about in the summer! I love this sling strap! The 100% cotton always makes it nice to carry, especially in the summer. 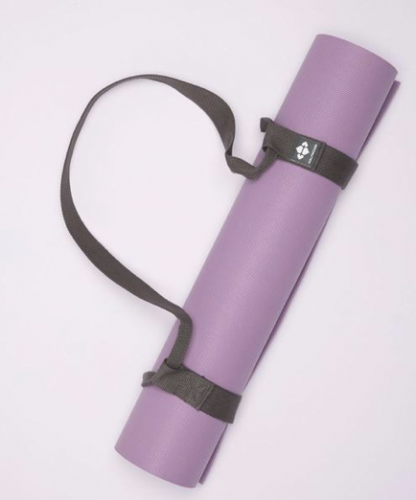 It fits any yoga mat for easy transporting which works great for all my different mats. When you get to class, it doubles as a yoga strap which is so convenient for traveling. How cool to have a yoga bag and a yoga strap, all in one?! This yoga mat sling strap is a great way to carry your mat to classes as well as on trips and vacations! I always love having a strap to practice with. I love items like these because it makes it easier to practice yoga no matter where I am. The hustle & bustle of life can get busy and complicated. I love finding new products that help make yoga easy to do in the chaos of today’s world! Another C9 Giveaway--a $200 gift card this time! Borrow for your Bump - Updates and Discount Code! Joolz Stroller: The Most Perfect Stroller Ever!